JioGigaFiber will offer up to 1Gbps FTTH broadband speeds and prices for the service could begin as low as Rs 500 per month. Reliance Jio announced its next firestarter after the JioPhone - JioGigaFiber - last month at RIL’s Annual General Meeting (AGM). The fiber-to-the-home (FTTH) broadband internet service by Jio has been under testing since more than a year and the company will finally start accepting user registrations for JioGigaFiber this Independence Day. That is, if all goes to plan. As was the case with the JioPhone when it first launched back in 2017, JioGigaFiber is already reported to be facing some last mile connectivity issues which could hinder its plans for a mass-scale roll-out. As of now, there is no concrete information available on the exact roll-out date for JioGigaFiber, but Reliance Jio has confirmed that the FTTH broadband service will be available across 1100 cities in India on the basis of registration requests received by the company. Reliance had also introduced the JioGigaTV set-top-box alongside JioGigaFiber. JioGigaTV is an internet connected 4K UHD set-top-box which could be bundled with the JioGigaFiber service, but it’s not yet confirmed if users will need to shell out extra cash to get the media streaming box along with Jio’s internet connection. Here’s all you need to know about Jio’s 1Gbps broadband service for homes. How to register for JioGigaFiber? JioGigaFiber with speeds of up to 1Gbps will be rolling out to 1100 cities across India sometime after August. However, registrations for the high-speed fiber broadband service will start on August 15. 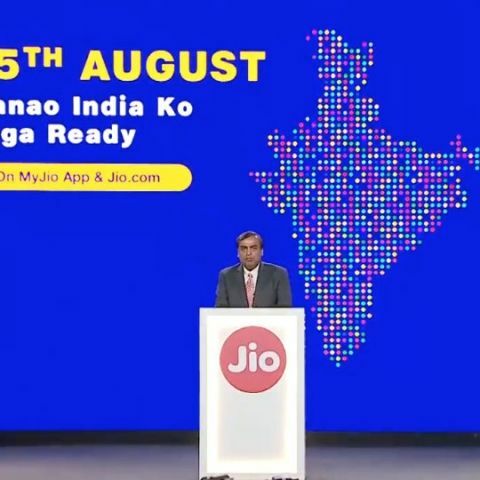 Those interested can register for JioGigaFiber on the MyJio app or on Jio.com starting August 15. The region/city for which the company receives the most amount of registrations will get JioGigaFiber connectivity first. Reliance Jio has been conducting beta trials for JioGigaFiber across the country and the service will be rolling out for commercial use, home use, and use by small businesses & merchants post the completion of the registration process. Jio aims at reaching 500 crore homes and 3 crore merchants across India with its JioGigFiber services. There have been no official announcements made by Reliance Jio on the pricing plans for JioGigaFiber, but a recent report by ET suggests that plans for the 1Gbps broadband service could start as low as Rs 500 per month. According to the report, Jio’s home broadband service will be even more affordable than its own or any other telecom operator’s 4G internet services. Another report by track.in lists out potential JioGigaFiber plans. In the report, a 50 Mbps speed plan with 500GB data is seen listed at Rs 499 per month. The pricing of the supposed Jio Fiber plans is seen going all the way up to Rs 3,599 for a 600 Mbps plan that provides 2,000GB of data for 30 days. These plans could very well be completely different from the official JioGigaFiber plans, but are in line with the latest ET report mentioned above. The JioGigaFiber Preview plan currently available to limited users offers up to 100 Mbps speeds for 90 days along with a monthly data quota of 100 GB and a complimentary access to a host of Jio's premium apps. In case, you consume 100 GB of your data quota within a month you can continue to enjoy our high speed internet services by performing a complimentary data top-up of 40 GB via MyJio App or through Jio.com. As this is a preview offer, there are no installation charges levied but there is a refundable security deposit of Rs.4,500 taken for the ONT device (GigaHub Home Gateway). This amount needs to be paid through Debit card, Credit Card, Jio Money or Paytm. For the official rollout, JioGigaFiber will come with the Jio GigaRouter. One can expect to pay a refundable security deposit for the router. According to the above cited ET report, Reliance Jio could finally kickstart its gigabit broadband services before November 7. A source told the publication that JioGigaFiber could initially launch in “the metros and about 80 top tier 1 and 2 markets”. We at Digit had earlier reported that the company has a December 2018 deadline to rollout Jio Fiber services and that they will initially be rolled out to top twenty cities across India including, Mumbai, Delhi, Kochi, Bhopal, Chandigarh and others, followed by a broader rollout as the company wants to establish a wide user-base in Tier-I and Tier-II cities first. JioGigaTV is an internet connected 4K UHD set-top-box which will house Jio’s suite of apps such as - JioTV, JioCinema, JioSmartLiving, JioStore, JioCloud and more. By the looks of it, users will also be able to cast their own media onto their TVs through the the JioGigaTV box, given that there is a MediaShare app also seen on its UI. A unique service announced by Jio for the JioGigaTV is TV Calling. The JioTVCall service will allow users of the JioGigaTV set-top-box to make video calls to each other through their television sets. Since JioTVCall will be an app, users will also be able to call any other mobile or tablet which houses the app and calls will be allowed across all networks. The JioGigaTV set-top-box will come with a Jio Remote which will be enabled for voice commands, just like the JioPhone. There is no word yet on the pricing, plans or availability of the JioGigaTV. August 15 is also the date when the JioPhone 2 will go up for pre-booking. Here is all you need to know about pre-booking the JioPhone 2.